If you know anything about me at this point, you know I love healthy food. I do my best to snack on fruits, veggies, and nuts, and I do my best avoid as much processed food as I can. When I do eat processed stuff, I make sure the ingredients are as simple and wholesome as possible. A friend told me about Graze boxes a long time ago, but I never really gave it much consideration. I wasn’t looking for a snacking subscription service back then. Now, though. Man, oh, man. Another friend gave me a code to try a free box, so I figured…why not? After one bite of some kind of dried blueberry and yogurt concoction, I was hooked. Now, after two months worth of boxes, I feel confident enough in the product to recommend it to all you folks, too. 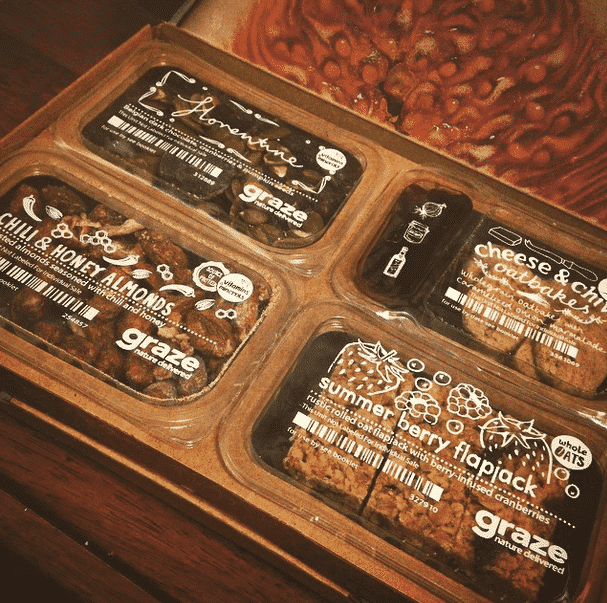 You guys should definitely head over and use the code BJK4TWCWP to get your own free Graze nibble boxes. What Time Is It? SNACK TIME! It’s always snack time. Or at least it feels that way. I eat a lot. Maybe it’s because I’m a runner, or maybe it’s because I just really love food. I don’t know. Regardless, I am munching on something pretty much all the time. I mean, usually, that’s an apple or a protein bar or grapes or some wasabi almonds or something like that, but there needs to be some variety. I eat like 2 snacks a day minimum, so there’s plenty of room for burnout. Luckily, I have Graze now. It’s $6.99 per box, and each box contains 4 snacks. That’s about $1.75 a snack, which isn’t absurd. Given how much I eat, can I realistically pay that for each snack I eat during the day? Nope. Not at all. But I have Graze nibble boxes delivered once every two weeks, which means I get to feel like I’m treating myself on 4 separate occasions. Keep in mind that you can set it anywhere between weekly to monthly deliveries, so you can find the frequency that works for you. And if I decide that I want more of them, you can always just go in and order another one to be delivered. 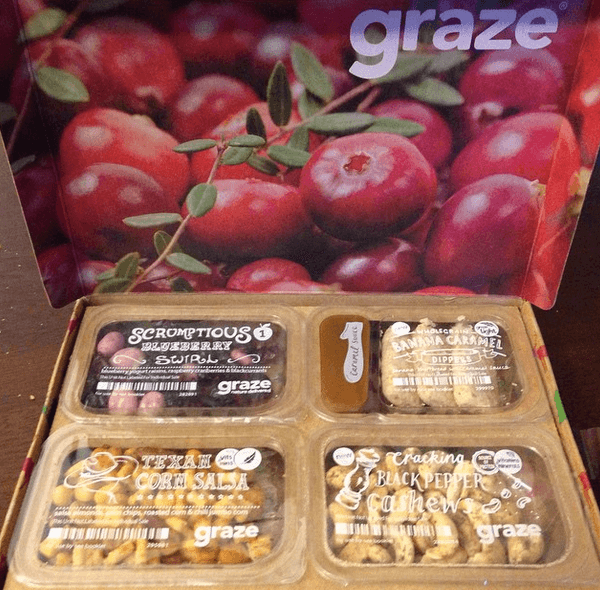 The ingredients being used for Graze boxes aren’t anything special, but they’re whole and mostly decent. These are still prepackaged snack boxes, so there are going to be ingredients beyond just the food itself. But not that many. I like that they don’t contain GMO foods or artificial colors and sweeteners, which are some my biggest issues. Instead of me rehashing it all, you can just go read their entire food/ingredient FAQ. 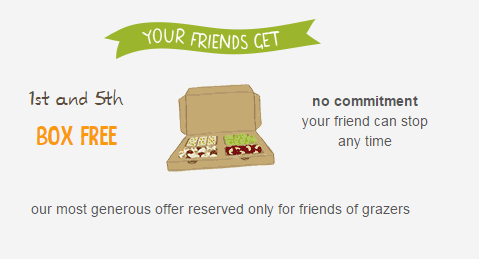 So yes, I do get something for referring you to Graze. When you sign up for a free box, I get free nomnoms, too! It’s awesome! And since you get the free first one regardless, you can cancel as soon as that sucker ships if you want to, never pay a dime, and we both get free boxes of awesome. Stay Shiny, FitGeeks! And Enjoy Your Free Food! Interesting! I may look into doing this! You definitely should. I got a new box in yesterday and ate some today, and it was a great way to start the workday. My friend even tossed me a bag of popcorn that came in his that he didn’t want. Double score!